“The female whale or dolphin, in her role as mother, is the linchpin of cetacean population and behavioral biology”, Whitehead and Mann, 2000. A look this week at why the Silver Bank is such a critical sanctuary for the humpback whales of the north Atlantic – having babies! Seventy miles from land, the Bank is a remote but shallow area and seasonal home for almost 5,000 whales each winter and early spring. Humpback whales are a migratory species, feeding during the summer at high latitudes and traveling 1,500 and more miles south each winter to warmer waters to mate and to give birth. There is much still unknown about reproduction in humpback whales. In recent years genetic studies have provided more detailed insights but for a long time evidence was based on whaling records and top-side observations, limited in their inability to even discern males from females. 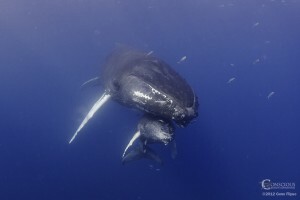 And while photographs appear to show mating and birth in Pacific populations, on the Silver Bank no one – to date – has captured photographic evidence of either. But while we haven’t seen it we know it’s going on! Witnessing the thrill of competing males in rowdy groups and the tender beauty of new, days old humpback whale calves leaves no doubt in the minds of any visitor. So here are a few notes on what we do we know about the female side of reproduction in humpback whales. More on the males in another post. Humpback whales do not have periods. Lucky things. But like all mammals they have estrus cycles, i.e they ovulate and have even been found to synchronize the timing of their estrus cycles. But, pregnancy lasts nearly a year. Females reach sexual maturity at 6-8 years of age. The typical pattern is: get pregnant in the Caribbean one winter, travel north for the summer and back down the next and have the baby. Their gestation period, aka pregnancy, lasts about 11 months. Newborns stay with their mothers for a year or so, so calves will be back down the next winter with mum but may wean any time thereafter. Calves are 12- 15 feet long at birth and weigh around a ton. 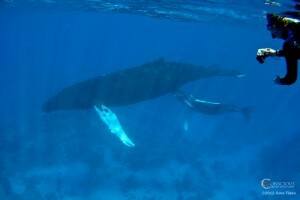 Okay, so they are whales after all (an adult female averages 40 feet and 40 tons) but that’s still a whopper! At birth, they are around 30% of their mother’s length, if just a fraction of their weight. It is thought that they are positively buoyant at birth, and they can swim, but are helped to the surface for their first breath. Calves enter the world tail first and the placenta easily dislodges and floats away. Newborn calves seen on the Silver Bank are a very pale, soft gray in color, darkening up within days as the melanin develops in their skin. We still don’t know much about the actual birth event for humpbacks on the Silver Bank. Does it take place at night? Are females alone? How long is their labor? But there’s only one of them. 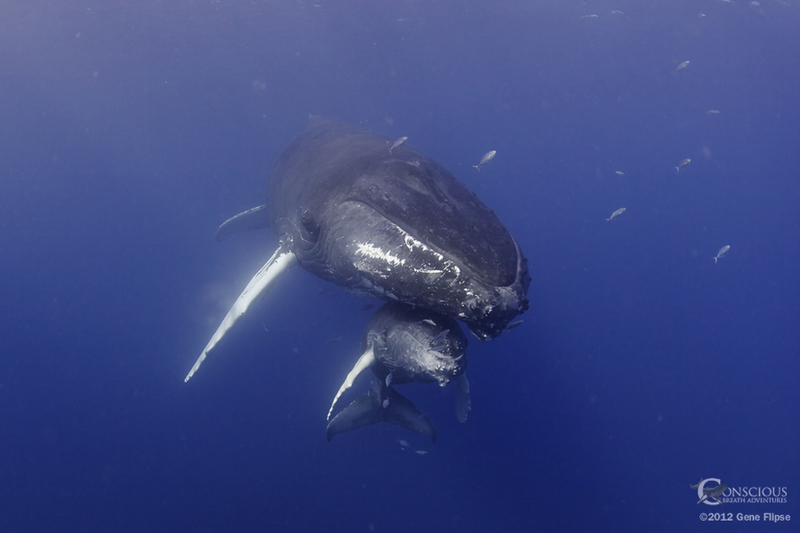 Humpbacks are uniparous, in other words they give birth to just one baby at a time twins are very rare, less than 1% of births. Nursing calves drink around 50 gallons of milk per day. Aside from how amazing it is to witness a baby humpback nursing, the whole lactation system is pretty interesting. With 40% fat content this yogurt-like milk is incredibly calorie rich, five times that of human breast milk. Calves do not ‘latch on’ and suckle in the human sense but some do show wear in the rostrum (nose) areas from positioning on their mother where milk is somewhat squirted in by compressor muscles in the mammary glands. The incredibly high energy demands of pregnancy and lactation at a time of prolonged fast is just one of the many reasons whale watching on the Silver Bank must be and is carried out with the utmost sensitivity to the animals. Moms have a lasting influence. Genetic studies undertaken in recent years have shown that groups of whales observed associating on feeding grounds are in fact related through the maternal line. It makes sense and has been born out in the lab – mothers pass on their life lessons on feeding and such to their calves so these small groups of possibly half siblings or cousins were reading from the same genetic and experiential textbooks, so to speak. Many fascinating questions still remain…how are they communicating with each other? How closely are the groups related and working together? While the males play no part in upbringing. Perhaps no surprises there! But more on the testosterone fueled side of the coin in our next post. It’s an honor to spend time on the Silver Bank as quiet observers during this profound time of life for north Atlantic humpback whales. Clearly reproduction is a fascinating part of their ecology with many unanswered questions. We hope science continues to provide insights that help us better understand and protect these amazing animals. Ilove getting your e-mails,and of course very jealious. One of the most exciting post was “Pinball” last winter with her 6th calf, we have been seeing her and her growing calf most of the summer along with other mom’s. I sure hopetoget down there soon. Regards from all of us up north in The Gulf of Maine! Thanks for your kind words about our Whale eMail newsletters, we enjoy sharing them, but not as much as we enjoy swimming with the whales! It’s been great over the last few years to really connect with folks up in Gulf of Maine/Stellwagen area who are so keen to help make the identifications and connect the dots on both ends of the humpback’s migrations. Pinball was a big hit, as was Spoon, too. 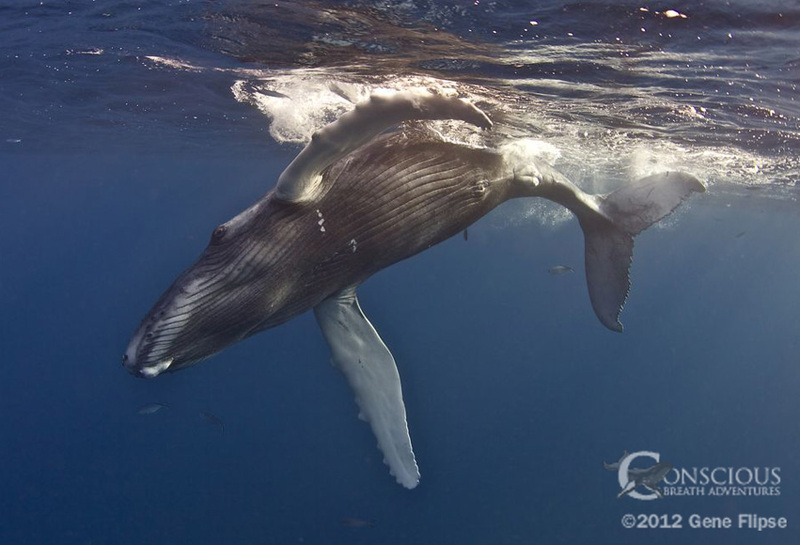 With help researchers have identified over 40 whales that we have seen on the Silver Bank with known whales in the North Atlantic Humpback Whale Catalog. We have even had guests swim with a whale on the Silver Bank in the winter and then see the same whale up in your area later that summer. How cool is that? I hope to meet you out on the Silver Bank swimming with whales some day. Let me know if I can ever be of service. We often talk of heading down there,we are a small non-profit based on Portsmouth, NH with onlt 3 staff,aside from our naturalists. I wish we could afford to head down there,perhaps some day! Your photo’s are amazing. We also met Ian from Plantet Whale at a work shop in Provincetown, great guy, another trip we are trying to afford! I look forward to more e-mails from you guys! It is always nice to connect with like-minded people and organizations. I’d be very happy to have your and the rest of the Blue Ocean Society team come on down to meet the whales in the water, it is a whole different point of view! When you decide you want to make the trip, let me know and I think we can work something out that will help. Conscious Breath Adventures will be attending Planet Whale’s WhaleFest at the end of October. While I haven’t met Ian or Dylan personally, I look forward to doing so soon. Thanks for posting, and watch for our next Whale eMail to come to you soon.